Streptococcus thermophilus is an important starter strain for the production of yogurt and cheeses. The analysis of sequenced genomes of four strains of S. thermophilus indicates that they contain several genes of the rgg familly potentially encoding transcriptional regulators. Some of the Rgg proteins are known to be involved in bacterial stress adaptation. In this study, we demonstrated that Streptococcus thermophilus thermal stress adaptation required the rgg 0182 gene which transcription depends on the culture medium and the growth temperature. This gene encoded a protein showing similarity with members of the Rgg family transcriptional regulator. Our data confirmed that Rgg0182 is a transcriptional regulator controlling the expression of its neighboring genes as well as chaperones and proteases encoding genes. Therefore, analysis of a Δrgg 0182 mutant revealed that this protein played a role in the heat shock adaptation of Streptococcus thermophilus LMG18311. These data showed the importance of the Rgg0182 transcriptional regulator on the survival of S. thermophilus during dairy processes and more specifically during changes in temperature. The species Streptococcus thermophilus is a Lactic Acid Bacterium (LAB) used as a starter of fermentation in yogurt and cheese production. In nature and during dairy fermentation processes, S. thermophilus is subjected to sudden changes in its environment and its industrial performance is conditioned by its ability to successfully adapt to harsh conditions. To survive, like many other bacteria, this species must develop appropriate physiological responses by modifying gene expression appropriately. One of the stresses, that S. thermophilus commonly encounters, is the modification of the temperature. For instance, during the production of dairy products, temperature shifts are applied to regulate the bacterial growth and, thus, control the lactic acid production . S. thermophilus survival against thermal stress is conditioned by its ability to sense and quickly adapt its physiology mainly by the synthesis of adequate proteins at the right moment. For example, adaptation of S. thermophilus to a lowering of temperature required the synthesis of a set of chaperones called cold shock proteins (Csp) that is strongly induced in response to a rapid decrease in growth temperature [2, 3]. As in other Gram positive bacteria, S. thermophilus also responds to thermal stress by synthesizing a conserved set of heat-shock proteins (Hsp), including both chaperones and proteases . Their role during heat stress is to rescue, or to scavenge, heat-denatured proteins. 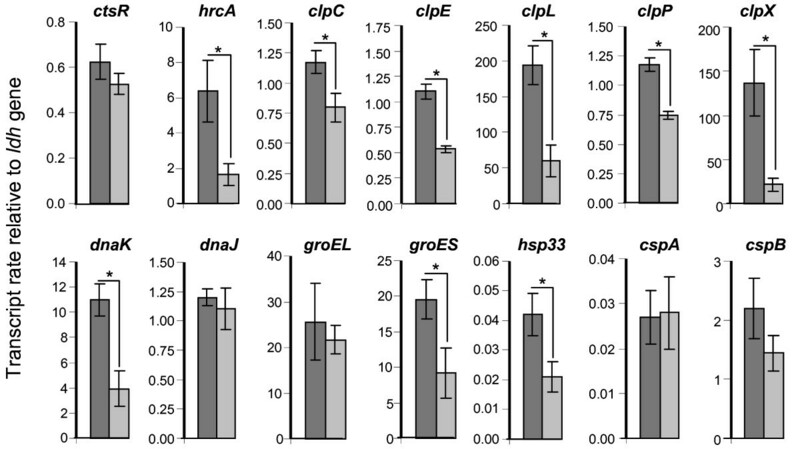 In LAB, the adaptation to heat shock required the two negative transcriptional factors HrcA  and CtsR  which negatively control the expression of major molecular chaperones (DnaK, DnaJ, GroEL and GroES)  and proteases (Clp family) , respectively. Furthermore, Zotta et al. (2009) have shown the involvement of the HrcA and CtsR proteins in the heat stress response of S. thermophilus Sfi39 . Apart from these data, little is known about the network of regulation controlling S. thermophilus adaptation to temperature changes. Among bacterial transcriptional regulators is the wide conserved family of Rgg regulators encoded by genes, exclusively found in the order of Lactobacillales and the family Listeriaceae . Rgg regulators act by binding to the promoter region of their target genes [10–13]. At their N-terminal end, they carry a Helix-Turn-Helix (HTH) XRE DNA-binding domain demonstrated to be important for their activity as transcriptional regulators . They are positive regulator [15, 16] or act both as activator and repressor [17, 18]. Most of the Rgg regulators control the transcription of their neighboring genes [9, 16, 19, 20]. However, Rgg from S. pyogenes NZ131, S. agalactiae NEM316 or S. suis SS2 are considered as global regulators since controlling highly diverse genes scattered on the genome [12, 13, 21, 22]. In these cases, Rgg proteins are involved in a network of regulation and modulate the expression of other transcriptional regulators, including several two-component regulatory systems, which are important in the transcriptional response to changing environments [12, 13, 21]. Several Rgg proteins contribute to bacterial stress response. For instance, the Rgg protein of Lactocccus lactis, also known as GadR, is associated with glutamate-dependent acid tolerance . Within Streptococcus, several Rgg proteins have been involved in oxidative- and/or to thermal-stress responses [23–25]. The high number of rgg genes observed in the genomes of S. thermophilus strains (7 in strains LMG18311 and CNRZ1066, 6 in LMD-9 and 5 in ND03) [26–28] suggests that their acquisition and their preservation are advantageous for S. thermophilus. However, the involvement of these genes in S. thermophilus LMG18311 stress response is still hypothetic and none of the 7 rgg genes of LMG18311 has been studied at the molecular level. To determine whether any of the rgg genes of S. thermophilus LMG18311 are involved in adaptation to changes in environmental conditions, Δrgg deletion mutant was constructed and its tolerance to different stresses was tested. In this study, we demonstrate that (i) the transcription of rgg 0182 gene from S. thermophilus LMG18311 is influenced by culture medium and growth temperature, (ii) Rgg0182 is a transcriptional regulator that modulate not only the transcription of its proximal target genes but is also involved in the network of regulation of the transcription of genes coding chaperones and proteases, (iii) this gene is involved in heat shock response. The rgg 0182 gene corresponds to the stu0182 gene of the complete genome sequence of S. thermophilus LMG18311 . However, the sequencing of the rgg 0182 gene (GenBank Accession JF699754) followed by its sequence comparison with the stu0182 gene revealed that this latter contained sequencing discrepancies (substitutions in positions 44, 46, 50, 579 and 681 compared to the rgg 0182 sequence). The rgg 0182 gene (864 bp) potentially encodes a protein of 288 amino acids with a predicted molecular mass of 35.6 kDa. This protein exhibited an identity of about 30% with other streptococcal proteins belonging to the Rgg family of transcriptional regulators and 35% identity (e-value = 8e-48) with Rgg1358 from S. thermophilus LMD-9 which was recently shown to be involved in a quorum sensing (QS) mechanism . Rgg0182 contained a HTH-XRE motif from amino acid 11 to 67 typical of Rgg regulators and a Rgg-C-terminal motif from amino acid 70 to 288 (Figure 1). Therefore, the rgg 0182 gene was predicted to encode a transcriptional regulator. Schematic representation of the rgg 0182 and rgg 1358 loci (A) and of the corresponding proteins (B). Although the rgg 0182 and rgg 1358 loci present analogies (A), they encoded distinct proteins (B). Numbers in panel A indicate the position of nucleotides, with the +1 position being that of the first nucleotide of the rgg 0182 gene. The "deletion fragment" corresponds to the deleted portion of the rgg 0182 gene in the Δrgg 0182 mutant. The broken arrows indicate the promoters. Pshp 0182 and Ppep 0182 materialized the position of the 126 bp and 165 bp PCR fragment respectively used in EMSA. In panel B, amino acids sequence identities are indicated in percent. HTH indicated the Helix-Turn-Helix-XRE motif. The gene rgg 0182 was surrounded by two ORFs (Figure 1), not annotated in the genome of the strain LMG18311, but revealed using the software bactgeneSHOW designed for small-gene detection . Indeed, upstream of the rgg 0182 gene was the shp 0182 gene (63 nucleotides long), potentially encoding a small hydrophobic peptide belonging to the group I of the SHP family . Downstream of rgg 0182 was the pep 0182 gene (42 nucleotides long), encoding a small peptide with no similarity with peptides found in databases. Although, the genetic organization of the rgg 0182 locus was similar to that of the rgg 1358 of the LMD-9 strain from S. thermophilus, these two loci were distinct as illustrated by the low sequence identity between the proteins encoded by them (Figure 1). The two shp genes were classified in two distinct groups from the SHP family . Finally, the rgg 0182 locus and its flanking genes were also found in the genome of CNRZ1066 strain but missing in the genome of ND03 and LMD-9 strains. In the literature, studies of rgg genes transcription are scarce. Indeed, only the ropB transcription from Streptococcus pyogenes has been studied . Thus, it was of interest to determine whether transcription of rgg was constitutive or not. To do so, the rgg 0182 transcription was studied by qPCR from cells cultivated in LM17 or CDM medium at 30 or 42°C. In all qPCR experiments, the values were normalized to the expression of the ldh gene encoding the lactate dehydrogenase. This gene was considered as a relevant reference since it was demonstrated to be constitutively expressed in all tested conditions (data not shown). The qPCR experiments were realized from three independent RNA extracts and done in duplicate. Figure 2A showed the relative transcription levels of the rgg 0182 gene in the LMG18311 strain. When cultivated at 42°C in LM17 medium, the wild-type strain showed a significant decrease in its rgg 0182 mRNA levels during growth. Indeed, the rgg 0182 mRNA level was highest in the exponential phase (0.16 +/- 0.08) and was down-regulated 4-fold in stationary phase (p = 0.01). Similar results were obtained in CDM medium at 42°C where the transcription of rgg 0182 was found to be more than 3-fold higher in the exponential phase than in stationary phase (p < 0.001). Whatever the medium tested, the transcription of rgg 0182 was found to be growth-phases dependent. Relative rgg 0182 gene transcript level from S. thermophilus LMG18311 cells, grown at 42°C (A) and at 30°C (B). Total RNAs from the wild type strain were extracted from exponential (E, white bars), transition (T, light gray bars) and stationary (S, dark gray bars) phase cells. Data are presented as the mean +/- standard deviation from three independent experiments performed in duplicate. Student's t test: *, p < 0.001. We then investigated whether rgg 0182 was transcribed at other temperatures and chose to work at 30°C, temperature at which S. thermophilus can be exposed during industrial processes (Figure 2B). When cells were cultivated at 30°C in LM17, the profile of rgg 0182 transcripts was similar with that observed at 42°C. In contrast when cells were grown at 30°C in CDM medium, an increase of rgg 0182 transcription was observed during the growth, i.e. the rgg 0182 mRNA level was more than 3-fold higher (p < 0.001) in stationary phase than in exponential phase. The rgg 0182 transcripts level of stationary phase cells grown in CDM medium was 14-fold higher (p < 0.001) at 30 than at 42°C indicating it was on the influence of the growth temperature. Taken together, these results revealed that the kinetics of rgg 0182 transcription was medium and temperature dependent and that the transcript level of rgg 0182 was the highest in stationary phase cells cultivated in CDM at 30°C. Data from the literature indicate that several products of rgg genes regulate adjacent genes [9, 16, 19, 20]. To determine whether the product of the rgg 0182 gene was involved in the transcriptional regulation of its flanking genes, we designed primers and used them in qPCR to measure the level of transcription of the shp 0182 and pep 0182 genes. However, the qPCR failed probably because of the small size of the pep 0182 and shp 0182 genes that did not allow the design of effective primers. As an alternative strategy, the activity of the pep 0182 and shp 0182 promoters was studied with transcriptional fusion in a wild-type and a Δrgg 0182 background. To do so, plasmids carrying transcriptional fusions coupling the intergenic region of each flanking gene to a luxAB-reporter fusion were constructed and named pGICB004::P pep0182 and pGICB004::P shp0182 , as well as the Δrgg 0182 strain carrying a chromosomal deletion of the rgg 0182 gene. Both plasmids were integrated in the wild-type or Δrgg 0182 mutant chromosome. Relative levels of activity of the pep 0182 and shp 0182 promoters were determined in both strains either grown in LM17 or CDM (Figure 3), at 30 or 42°C. Whatever the conditions, no significant difference in the growth rate or yield was observed between the wild type and the mutant. In LM17 at 30 and 42°C, almost no luciferase activity was detected with both promoters in the wild type or the Δrgg 0182 background (data not shown). This suggests that the promoters P pep0182 and P shp0182 are not active in these experimental conditions. In contrast in CDM medium, for both promoters in a wild type background, a luciferase activity was detected at 30°C and 42°C (Figure 3). Nevertheless, the maximum of P pep0182 -luxAB and P shp0182 -luxAB activity were 28- and 6-fold higher (p < 0.001) at 30°C than at 42°C, respectively. In addition, the level of activity of the P pep0182 -luxAB and P shp0182 -luxAB fusions differed between the wild-type and the mutant strains. 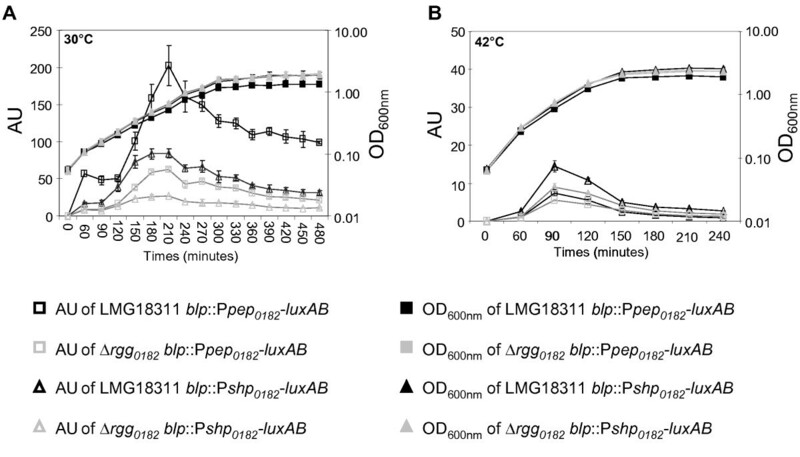 Indeed, in cells cultivated in CDM at 30°C, in the Δrgg 0182 mutant the P pep0182 -luxAB and the P shp0182 -luxAB showed both a maximum activity that was 3-fold lower (p < 0.001) than in the LMG18311 strain (Figure 3). These results demonstrated that rgg 0182 played a role in the regulation of the transcription of both P pep0182 -luxAB and P shp0182 -luxAB fusions and supported the hypothesis that Rgg0182 may, directly or not, regulate the transcription of pep 0182 and shp 0182 genes. Moreover, the growth medium, as described above and by Ibrahim et al. (2007b), and, in an original way, the temperature were parameters that influenced the levels of activity of the promoters P pep0182 and P shp0182 . Luciferase activity and growth of the LMG18311 and the Δ rgg 0182 strains containing the P shp0182 - luxAB and P pep0182 - luxAB transcriptional fusions, in CDM medium. The expression of the fusions was followed in strains cultivated in CDM medium, at 30°C (A) or at 42°C (B). Data are presented as the mean +/- standard deviation of three independent experiments. AU: luminescence arbitrary units normalized against the OD600nm of the cultures. The results above and the presence of the HTH motif on the N-terminal part of Rgg0182 protein suggested that Rgg0182 may regulate the transcriptional activities of the P shp0182 and the P pep0182 promoters by binding to their DNA sequences. To test this hypothesis, DNA electrophoretic mobility shift assay were carried out. To do so, the His6-Rgg0182 protein was overproduced in E. coli C41(DE3), verified by SDS-PAGE and Western blot (data not shown). Immobilized Metal ion Affinity Chromatography (IMAC) purification of the His6-Rgg0182 protein was performed. The purity of the Rgg0182 protein was assessed by SDS-PAGE using Coomassie blue protein staining, i.e. only one band of the expected molecular mass (35.7 kDa) was revealed (data not shown). A 126 bp PCR amplified DNA fragment (Figure 1), including the entire 72 bp intergenic rgg 0182 -shp 0182 region and part of the 5' end of the shp 0182 and rgg 0182 genes, was incubated with the purified His6-Rgg0182 protein. 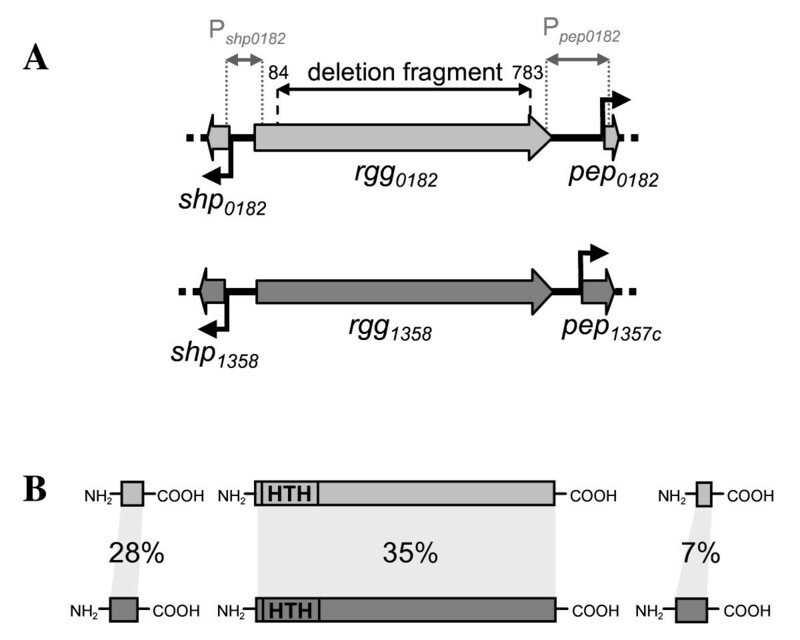 As can be seen in Figure 4, the Rgg0182 protein retarded the shp 0182 promoter DNA fragment. The same experiment was realized with a 165 bp PCR amplified fragment, covering the entire 150 bp intergenic rgg 0182 -pep 0182 region including the pep 0182 promoter, and analogous results were obtained (Figure 4). The P ldh probe corresponding to the promoter region of the ldh gene was chosen as a negative control in EMSA experiments since its expression was not under the control of Rgg0182. Using P ldh as a probe, no DNA retardation was observed, demonstrating that Rgg0182 binds specifically to the promoter of its target genes. Thus, these results demonstrated conclusively that Rgg0182 activated the shp 0182 and pep 0182 genes transcription by binding to their promoter regions. Analysis of the Rgg 0182 binding to DNA. Electrophoretic mobility shift assay (EMSA) of the promoter regions of the two target genes (shp 0182 and pep 0182 ) of Rgg0182 in the absence or in the presence of the purified His6-Rgg0182 protein. DNA probes labelled with biotin (0.1 pmol each) were incubated with 2 pmol of Rgg0182. The P ldh probe is an ldh promoter fragment used as a negative control. 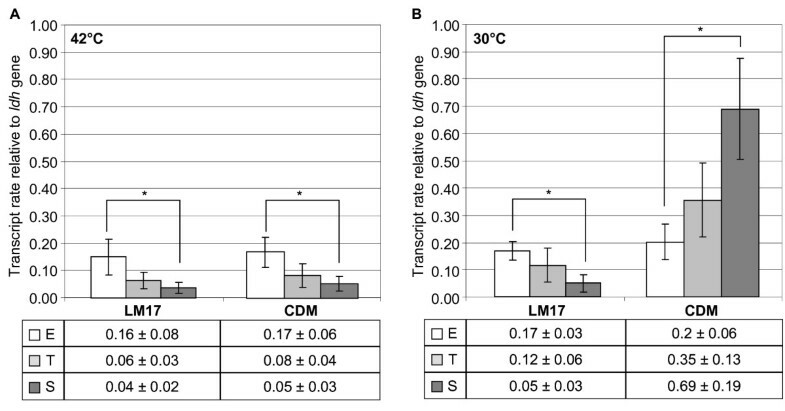 The impact of temperature on the rgg 0182 gene transcription suggested a role for the Rgg0182 protein on S. thermophilus LMG18311 adaptation to thermal changes. Thus, we hypothesized that Rgg0182 might control the transcription of genes encoding a set of heat- and cold-shock proteins including chaperones and proteases. Chaperones and ATP-dependent proteases play a major role for bacterial survival under conditions of heat stress where proteins tend to unfold and aggregate. Based upon the S. thermophilus LMG18311 genome sequence , genes predicted to encode the major chaperones and proteases involved in heat shock responses were selected for analysis: clpC, dnaK, dnaJ, hsp33, groES, groEL, clpP, clpX, clpE, clpL (Genbank Accession NC_006448, locus tags stu0077, stu0120-0121, stu0180, stu0203-0204, stu0356, stu0581, stu0602, stu1614, respectively). The two cspA and cspB genes (locus tags, stu0837-0838 respectively), involved in S. thermophilus cold stress response, were also included in this study. The transcript levels of these genes were measured by qPCR on stationary phase cells of the wild-type and the Δrgg 0182 mutant grown in CDM medium at 30°C (i.e. when rgg 0182 was the most transcribed) from 3 independent experiments done in duplicate (Figure 5). In these conditions, the transcript level of almost all genes encoding protease and chaperone proteins (except that of dnaJ, groEL, cspA and cspB) was under-expressed in the Δrgg 0182 mutant compared to the wild type strain suggesting a role for Rgg0182 in the control of their transcription. The difference in the transcript abundance between the wild type and Δrgg 0182 mutant strains ranged from 1.5- to 20-fold and were statistically significant (P < 0.001). As described in other Streptococcus transcriptional analysis, a 1.5-fold difference in transcript level was interpreted as a significant difference in expression between the strains [21, 23]. Relative genes transcript level of S. thermophilus stationary phase cells grown in CDM medium at 30°C. Total RNAs were extracted from stationary phase cells of S. thermophilus LMG18311 (dark gray bars) and its isogenic Δrgg 0182 mutant (light gray bars) grown in CDM at 30°C. Data are presented as the mean +/- standard deviation of the gene transcript levels measured from 3 independent experiments done in duplicate. Student's t test: *, p < 0.001. In low-GC Gram positive bacteria, the control of the transcription of the clp family genes and of dnaK and groES genes is primarily mediated by binding of the CtsR and HrcA repressors, respectively, to promoter region of target genes. In S. thermophilus LMG18311, we found CtsR operators (AGGTCAAANANAGGTCAAA)  upstream of clpP, clpE, clpL, ctsR, clpC and groEL genes and HrcA binding sites (GCACTC(N)9GAGTGCTAA)  only upstream of hrcA, groEL (with 2 mismatches) and dnaJ (6 mismatches). These results prompted us to evaluate the level of ctsR and hrcA transcripts (locus tags, stu0076 and stu0118 respectively) in the wild-type and the Δrgg 0182 mutant. These data revealed no significant difference for ctsR gene whereas the hrcA transcript level was nearly 4-fold reduced in the absence of rgg 0182 suggesting that Rgg0182 positively controls hrcA transcription. These results indicate that Rgg0182 is a positive transcriptional regulator of heat shock proteins encoding genes in particular of hrcA, clpC, clpE, clpL, clpP, clpX, dnaK, groES and hsp33 genes. Knowing that several rgg genes from pathogenic streptococci are involved in stress response and taking into account the above data, we checked whether rgg 0182 could be involved in the S. thermophilus adaptation to heat shock. The heat tolerance was evaluated on stationary phase cells grown for 10 h in CDM medium (OD600nm = 1.5) or in LM17 medium (OD600nm = 2.5) at 30°C (where rgg 0182 was found to be higher or lower transcribed, respectively) before (control condition) and after a 15, 30, 45 and 60 minutes incubation at 52°C (temperature limit for growth of S. thermophilus LMG18311 in our laboratory conditions). The experiments were realized 3 times independently in triplicate. Using the LM17 medium (data not shown), no significant difference was observed between the strains. An exposure at 52°C, whatever its duration, resulted in a 20% decrease of the survival of both strains. On the contrary, when stationary phase cells grown in CDM were exposed to a 52°C heat stress for up to 30 min, the mutant showed a significant increase of the sensibility compared to the wild type (p < 0.001) (Figure 6). The heat tolerance of the Δrgg 0182 mutant decreased gradually with the heat exposure time (72%, 53%, 46% and 38% of survival at 15, 30, 45 and 60 minutes, respectively). Between both strains, a difference of survival was observed at 30, 45 and 60 minutes where the mutant was up to 1.75 fold less resistant than the wild type strain. Thus, the decreased of survival of the mutant show that rgg 0182 plays a role in S. thermophilus adaptation to heat stress. Survival of the S. thermophilus strain LMG18311 and the Δ rgg 0182 mutant after heat shock (0, 15, 30, 45 and 60 min at 52°C). S. thermophilus was cultivated in CDM medium at 30°C and then exposed to heat stress. The percentage of survival was calculated as N/N0 ×100 where N0 is the CFU number of the control condition and N the CFU number in heat stress condition. Dark gray bars correspond to wild type strain and light gray bars correspond to Δrgg 0182 strain. Data are presented as the mean +/- standard deviation of 3 independent experiments done in triplicate. Student's t test: *, p < 0.001. The impairment of the survival of the Δrgg 0182 mutant cells following a sudden increase in temperature suggested that the rgg 0182 gene may act to regulate the transcription of S. thermophilus genes involved in the heat shock response. To investigate a possible role for Rgg0182 in changes of the transcription of heat shock genes, the transcript level of genes encoding chaperones and proteases were measured by qPCR. The transcript levels of the 14 selected stress-responsive genes were studied, in three independent experiments done in duplicate, on stationary cells of the wild-type and the Δrgg 0182 mutant grown in CDM and exposed 30 minutes at 52°C. Our results showed that clpE and cspB genes were about 2-fold less and 3-fold more transcribed, respectively, in the mutant strain compared to wild-type (p < 0.001) (Figure 7). No significant difference was observed for the other genes studied (data not shown). This observation suggests that at high temperature, Rgg0182 is a positive regulator of clpE transcription and a negative regulator of cspB transcription. 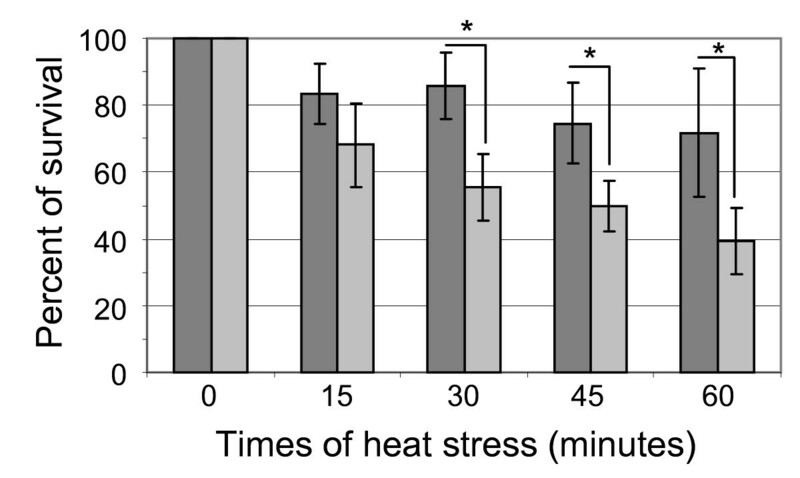 Relative genes transcript level of S. thermophilus cells exposed to a heat stress. Total RNAs were extracted from stationary phase cells of S. thermophilus LMG18311 (dark gray bars) and its isogenic Δrgg 0182 mutant (light gray bars) grown in CDM at 30°C until stationary phase and then exposed 30 min at 52°C (heat stress condition). Data are presented as the mean +/- standard deviation of the gene transcript levels measured from 3 independent experiments done in duplicate. Student's t test: *, p < 0.001. The aim of the present study was to determine if Rgg0182 functioned as a transcriptional regulator. First, we showed that it was transcribed in a growth phase dependent manner i.e., in LM17 (at 30°C and 42°C) or CDM (at 42°C), a higher expression level was observed in exponential phase than in stationary phase. Interestingly, using CDM medium, it was found that the rgg 0182 transcripts were more abundant at 30°C than at 42°C suggesting that rgg 0182 transcription was also influenced by temperature. Because of their immediate vicinity with the rgg 0182 gene, the transcription of shp 0182 and pep 0182 genes was hypothesized to be under the control of Rgg0182. This was confirmed by the use of transcriptional fusions showing that the activation of the P shp0182 and P pep0182 promoters required the presence of Rgg0182 and that their activity was optimal under the conditions were transcription of the rgg 0182 gene was mostly expressed (i.e. in CDM medium at 30°C in stationary phase growth). Finally, to confirm the probable interaction of Rgg0182 with DNA, EMSA experiments were carried out and demonstrated conclusively that Rgg0182 binds to the promoter region of the shp 0182 and pep 0182 target genes. Together these results were in coherence with Rgg0182 being a transcriptional regulator, positively and directly, controlling the expression of shp 0182 and pep 0182 genes. The rgg 0182 locus combined a gene encoding a transcriptional regulator of the Rgg family with another gene encoding a small hydrophobic peptide of the SHP family. Recently, one of these shp/rgg loci, named shp/rgg 1358 in LMD-9 has been demonstrated to encode two components of a novel QS mechanism . This system involves a Rgg transcriptional regulator and a SHP pheromone that is detected and reimported into the cell by the Ami oligopeptide transporter. The target gene of the shp 1358 /rgg 1358 pair, called pep 1357C , is located just downstream of the rgg 1358 gene, and encodes a secreted cyclic peptide . By analogy with the Shp1358/Rgg1358 locus, we hypothesize that the SHP0182/Rgg0182 pair would also been involved in a QS mechanism with Shp0182 being a pheromone possibly controlling the activation of the Rgg0182. Thus, one hypothesis to explain the high rgg 0182 transcript level in CDM is to consider that the rgg 0182 transcription would be under the control of the Rgg0182/SHP0182 pair and to consider that in a medium free of peptide, the internalization of shp 0182 by Ami transporter would be facilitated. Moreover, the mechanism of rgg 0182 expression seemed to be more complex than that of rgg 1358 since not only influenced by the culture medium but also by the temperature. Further experiments will be done (i) to determine whether the QS mechanism involving the SHP1358 and the Rgg1358 can be generalized to other SHP/Rgg pairs, including SHP0182/Rgg0182 pair and (ii) to understand the mechanism by which temperature could influence the rgg0182 expression. On the other hands, induction of the rgg 0182 expression at 30°C suggests that this gene might participate in the physiological adaptation of S. thermophilus to this temperature. When cells were cultivated in CDM at 30°C, the inactivation of rgg 0182 was associated with a reduce expression of genes encoding chaperone and protease proteins. In Bacillus subtilis, the DnaKJ complex facilitates substrates folding to the native state and the GroESL complex provides an isolated environment for the proper folding of small protein substrates . The degradation of unfolded proteins and small peptides is ensured by a protease complex composed of the protease subunit ClpP and several ATPases of the Clp family . Thus, the Rgg0182 is a transcriptional regulator whose biological roles would be to control the homeostasis of chaperone and protease proteins in cells grown at 30°C in CDM. This is in concordance with data obtained in S. pyogenes where Rgg is found (at the protein level) to control the expression of ClpL, ClpP, GroEL and DnaK in stationary phase (4). Furthermore, it was shown that ClpL protein of S. thermophilus Sfi39 is necessary for correct response to both heat and cold stresses . Results of qPCR experiments also showed an effect of Rgg0182 on hrcA expression. However, preliminary EMSA results (data not shown) indicated that the Rgg0182 protein did not bind to the hrcA promoter region. This suggests that the transcription of hrcA obviously is stimulated by Rgg0182 indirectly, perhaps by influencing the expression of another regulatory protein. Such indirect regulation has already been reported for other Rgg proteins [12, 13, 21] and, in the present study, might be extended to, at least, some of the rgg 0182 distal target genes. Finally, to assess the significance of Rgg-associated changes in the expression of genes involved in the heat shock response, we checked whether the deletion of rgg 0182 had an impact on the survival of the strains under heat stress conditions (shift from 30°C to 52°C for 15 min to 60 min). Interestingly, an impaired survival of the mutant was observed but only when the cells were cultivated in the CDM medium, i.e. in conditions where the difference in the level of rgg 0182 transcripts was maximal between both strains. In the mutant cultivated in CDM, the percent of survival decreased with the duration of the heat exposure. These results demonstrated a role for Rgg0182 in S. thermophilus fitness in response to sudden increased of the temperature. As observed in other streptococcal strains [24, 25], the deletion of the rgg 0182 gene is not associated with a drastic modification of the survival to stress suggesting that this regulator is not essential but important for heat stress adaptation. Furthermore, our results showed that cspB and clpE genes were 2-fold lower and 3-fold higher, respectively, in the mutant compared to the wild-type strain after the heat stress. Data from literature indicate that most Csp proteins are required when cells are grown at low growth temperature [2, 3]. Thus, the Rgg0182 would negatively control the production of CspB when the latter is not required. 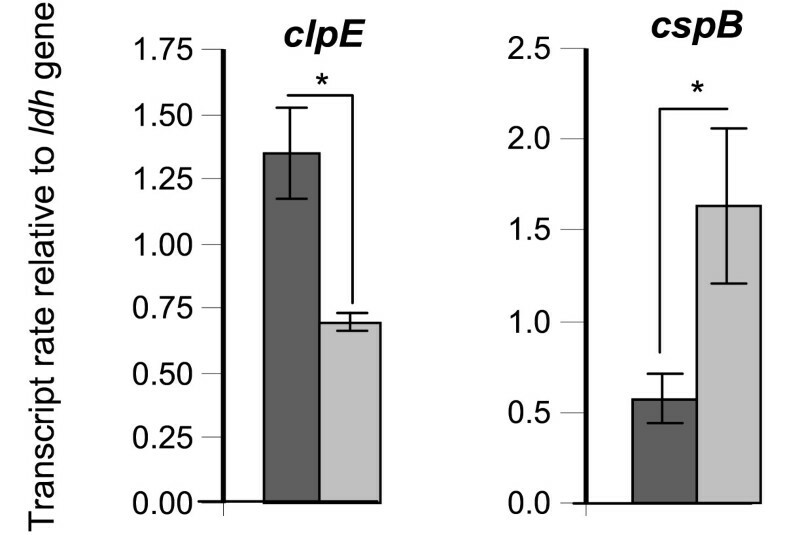 Moreover, in S. pneumoniae, the clpE gene has been demonstrated to be required for thermo-tolerance , therefore we hypothesize that the heat sensitivity of the S. thermophilus Δrgg 0182 mutant would result, at least partially, from a reduced level of ClpE expression. Alternatively, it is also conceivable that Rgg0182 regulates the transcription of other genes encoding proteins involved in the S. thermophilus heat stress response. A transcriptomic analysis would identify all targets of this regulator within S. thermophilus LMG18311. In conclusion, our study gave a better understanding of the thermal adaptation of the important dairy starter, S. thermophilus. These data showed the importance of the Rgg0182 transcriptional regulator on the survival of S. thermophilus during industrial processes and more specifically during changes in temperature. Streptococcus thermophilus LMG18311 and its derivatives are presented in Table 1. S. thermophilus strains were grown at 30 or 42°C in M17 medium with lactose (10 g/l) (LM17, a classical medium for S. thermophilus growth)  or in a chemically defined medium (CDM, a peptide free-medium) . Pre-cultures were incubated at 42°C in milk medium except for the luciferase assays as mentioned below. For numeration, agar was added to the medium (15 g/l) and cells were incubated under anaerobic conditions using GENbox anaer in Generbox jars (bioMérieux SA, Marcy-l'Etoile, France). S. thermophilus strains containing the pG+host9 vector  were cultivated in the presence of erythromycin (final concentration 2 μg/ml) at 30°C when plasmid self-maintenance was required and at 42°C for selection of clones with the chromosome's integrated plasmid. E. coli strains were grown in Luria-Bertani (LB) medium  at 30 or 37°C with shaking (250 rpm). E. coli EC101  was used as a host for recombinant plasmids derived from pG+host9  and E. coli C41(DE3)  for recombinant plasmids derived from pET15b (Novagen). When required, erythromycin (150 μg/ml) or ampicillin (150 μg/ml) was added. Conventional techniques for DNA manipulation, such as preparation of chromosomal and plasmidic DNA, restriction enzymes digests, PCR experiments, transformation by electroporation and Southern blotting were performed as described . Plasmids and primers used in this study are listed in Table 1 and Table 2, respectively. Oligonucleotides were purchased from Eurogentec (Liège, Belgique). Sequencing reactions were done from PCR products by the Beckman Coulter Genomics Society (Grenoble, France) using an ABI 3730XL Sanger sequencing platform. The Δrgg 0182 mutant was constructed following the experimental procedure described by Layec et al. (2009)  using the following primers pairs: rgg0182I1/rgg0182I2 and rgg0182II1/rgg0182II2 to amplify fragments I and II, respectively. The resulting Δrgg 0182 mutant was checked by sequencing. The construction of pGICB004::P pep0182 and pGICB004::P shp0182 vectors was done as described in . Briefly, the pep 0182 and shp 0182 promoters were amplified by PCR using the couple of oligonucleotides Pep0182up/Pep0182down and SHP0182up/SHP0182down, respectively. Following a digestion with restriction enzymes SpeI/EcoRI, both fragments were independently inserted downstream from luxAB in the pGICB004 plasmid previously digested with the same restriction enzymes. The pGICB004 plasmid was used since it allows the integration of transcriptional fusions to the luxAB reporter genes at the blp locus in S. thermophilus . The final pGICB004::P pep0182 and pGICB004::P shp0182 plasmids were used to transform the LMG18311 and in its derivative Δrgg 0182 strain. The strains LMG18311 blp::P pep0182 -luxAB, LMG18311 blp::P shp0182 -luxAB, Δrgg 182 blp::P pep0182 -luxAB and Δrgg 182 blp::P shp0182 -luxAB were obtained by gene replacement at the blp locus as described in . For the construction of the pET15b::rgg 0182 plasmid necessary for the Rgg0182-His6-tagged protein overexpression, the rgg 0182 (864 bp) gene was amplified by PCR using the primers Rgg0182SE1 and Rgg0182SE2 which contained NdeI and BamHI restriction sites, respectively, with S. thermophilus LMG18311 chromosomal DNA as template. The amplified DNA fragment was double digested with restriction enzymes NdeI/BamHI and fused in-frame to the 3'end His6-tagged of pET15b vector (Novagen), generating the pET15b::rgg 0182 plasmid. The in-frame fusion was confirmed by DNA sequencing. To perform luciferase assays, pre-cultures were grown overnight at 30 or 42°C in CDM or LM17 medium. Pre-cultures were then diluted to an OD600nm of 0.05, in 50 ml of respective appropriate medium and temperature. A volume of 1 ml of the culture was sampled at regular intervals during the growth until the stationary phase and analyzed as follows: OD600nm was measured, 10 μL of a 0.1% nonyl-aldehyde solution was added to the sample and the luminescence was measured with a Luminoskan TL (Labsystems). Results are reported in relative luminescence divided by the OD600nm (AU). Three independent experiments were realized. Expression of the His6-tagged protein was induced in E. coli C41(DE3) containing pET15b::rgg 0182 for 4h at 30°C by adding Isopropyl β, D-thiogalactopyranoside (IPTG, 1mM final concentration) to the OD600nm = 0.5 culture. Cells were harvested by centrifugation at 14,000 rpm, at 4°C for 30 min. The supernatant was discarded and cells were suspended in lysis buffer (50 mM phosphate sodium pH 8.0, 300 mM NaCl, and 10 mM imidazol) and stored at -20°C. The cells were disrupted on ice with a microtip of Sonifier 250 (Branson Ultrasonics). The soluble fraction including the recombinant His6-tagged protein was collected by centrifugation at 20,000 rpm for 45 min at 4°C and loaded on an affinity chromatography column equilibrated with lysis buffer. When the UV absorbance at 280 nm had fallen to the zero baseline, the recombinant Rgg0182 protein was eluted by elution buffer (50 mM phosphate sodium pH 8.0, 300 mM NaCl, 250 mM imidazol). The eluted fraction was collected and finally concentrated in Tris EDTA buffer pH 8.0. The purity of the His6-tagged proteins was confirmed by sodium dodecyl sulphate-polyacrylamide gel electrophoresis (SDS-PAGE) using 15% acrylamide resolving. For Western blot experiments, proteins were size separated by SDS-PAGE 12% acrylamide resolving gel and electroblotted onto polyvinylidene difloride (PVDF) membrane (Roche Applied Science) using a semi-dry blotting system (Bio-Rad). After transfer, the PVDF membrane was blocked with 5% skim milk in Tris-buffered saline containing 0.1% tween 20 (TBS-T) for 1 h. The membrane was subsequently incubated for 1 h with penta-His antibodies (1:10,000) (Qiagen), washed three times with TBS-T and incubated for 1 h with conjugated goat anti-mouse immunoglobulin G (H + L)-horseradish peroxidase (1:10,000) (Bio-Rad). The membrane was washed three times with TBS-T. Finally, the antibodies-antigen complexes were visualized by using the Bio-Rad Immun-Star Western system as described by the manufacturer and were detected by chemiluminescence, using the Chemi-Doc from Bio-Rad. The DNA binding of the His6-tagged Rgg0182 protein to the shp 0182 and pep 0182 promoter regions was tested by EMSA using the LightShift Chemiluminescent EMSA Kit (Thermo Scientific). The promoter regions of ldh (P ldh , 110pb), shp 0182 (P shp0182 , 126 bp) and pep 0182 (P pep0182 , 165 bp) were amplified by PCR using the Pldh-5'/Pldh-3', Pshp-3'/Pshp-5' and Ppep-3'/Ppep-5' primers, respectively. These were 3'-end biotin labelled with Biotin 3' End DNA Labeling Kit (Thermo Scientific) and used in EMSA according to the manufacturer's instructions. Chemiluminescent detection of biotin DNA on membranes was realised with the Chemi-Doc apparatus (Bio-Rad). RNA extractions were adapted from Kieser et al. (1999) . RNAs were extracted from cultures grown in CDM or LM17 medium in exponential, transition, or stationary phase at 30 or 42°C. RNAs were also extracted from stationary phase cells exposed to a 30 min temperature shift from 30 to 52°C. The RNAs were treated with amplification grade DNase I (Euromedex). The quantity and quality of the RNA samples were verified by agarose gel electrophoresis and by measuring their absorbance at 260 and 280 nm (NanoDrop-1000). Reverse transcription was performed according to the manufacturer's instructions (MMLV-reverse transcriptase, Invitrogen). cDNA was generated from 1.25 μg of DNA-free RNA and used for qPCR analysis of transcription of rgg0182 gene and its potential target genes transcript levels. Gene transcripts quantification was done using the CFX96 manager software (Bio-Rad) with the following program: 1 cycle at 98°C for 3 min and 40 cycles at 95°C for 10 s and at 58°C for 45 s. The amplification reactions were carried out with SYBR Green Supermix (Bio-Rad). Melting curve analysis was performed with 0.5°C increments every 10 s from 55 to 95°C to check that the cDNA amplification did not lead to secondary products. The primers used for qPCR are listed in Table 2. The efficiency of all primers pairs was checked in qPCR using serial dilutions of cDNA, and ranged from 90 to 100%. The level of gene transcript was calculated with ldh gene as the internal control gene for normalization . Stationary phase cells were harvested from cultures grown in CDM at 30°C by centrifugation at 4,500 rpm for 10 min. Cells were washed twice and resuspended in 10 mM sterile phosphate buffer, pH 7.0 with a final OD600nm of 1.0. Then, for heat stress, cells were treated by incubation at 52°C during 15, 30, 45 and 60 min (heat stress condition) or not (control condition). Cultures were then diluted to appropriate concentrations, spread on LM17 agar plates and incubated overnight at 42°C under anaerobic conditions. A percentage of survival was calculated as N/N0 ×100 where N0 is the CFU number of the control condition and N the CFU number after heat stress condition. Three independent experiments done in triplicate were realized. Data are expressed as mean +/- standard deviation (SD). Statistical analysis was performed with Student's t test. A p value < 0.05 was considered statistically different. The DNA sequence reported in this paper has been deposited in GenBank under accession number JF699754. This study was supported by the Institut National de la Recherche Agronomique (INRA) and the Ministère de l'Education Nationale de la Recherche et de la Technologie (MENRT). We thank N. Rouhier for his technical advices and his technical supports. We thank S. Payot-Lacroix and M. Genay-Bernard for critical reading of the manuscript. Conceived and designed the experiments: RH EB BD NL. Performed the experiments: RH EB RG SB BF. Analyzed the data: RH EB RG BF NL. Wrote the paper: RH EB NL. All authors read and approved the final manuscript.